Your love was written in the stars and now those stars have aligned to announce your wedding date on these save the date magnets. Your photo is printed along with the "Save the Date" design in white as shown. 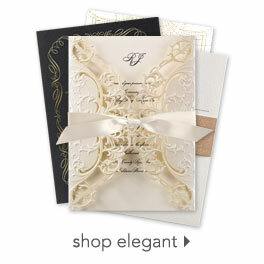 Your wording is printed in white in your choice of lettering styles. White mailing envelopes are included with these save the date magnets. Personalization Options: Design is printed as shown. Your wording is printed in white in your choice of fonts. My fiance and I initially were not going to send Save the Date information. However, after repeatedly being asked about the wedding date, even though we'd told people several times, we changed our minds. We wanted to send something that was different and had our picture on it. The magnet served this purpose. We love how it turned out! All of our family and friends loved it! They had never received anything like this. As always with Invitations by Dawn we got exactly what we asked for, on time (actually early) and at a fantastic price! Everyone who has received my Save the Date magnets loves them. I bought these because magnets can stay on the fridge forever and not just thrown in drawer to be forgotten about. These are wonderful, exactly what we wanted and all of our friends have loved them as well! Absolutely love my save the dates! They are the perfect size not too small and not overly large that I will have to pay extra postage :) I was very pleased with shipping. They were delivered very quickly and were in my mailbox before they said they would be. They were very fast and told me when everything was being processed and shipped. But the picture quality was not the greatest. If you do find one you like get a proof before you buy the whole package!!! We ordered the save the dates on a Tuesday and they were in by Friday. We also loved that they didn't cost an arm and a leg. This save the date was great. It was a light weight magnet that wasn't flimsy or to heavy. The overall look was great and it was the perfect fit for me. I loved the magnets!! We just mailed them out today! I used this product as a save the date card for our wedding. Its perfect for your guest to place on the fridge as a friendly reminder. After searching several sites and hundreds of designs, my fiance and I decided on these save the dates magnets for our wedding. They were the most reasonably priced for what we were looking for. The fact that we could include a picture with the text was a huge plus. Also, they didn't require extra postage to mail, which is huge when you are sending out hundreds of these. The only downside was, the customizable part of these was not very customizable. We wanted to make the font bigger for our older guests to be able to read more easily, and it wouldn't let us, no matter what we tried. We found this to be an issue with every save the date we looked at on every site though - you can't fully customize things to the way you want them; whether it's colors, font, font size, etc. But, overall we were satisfied with these save the dates and loved how they turned out.